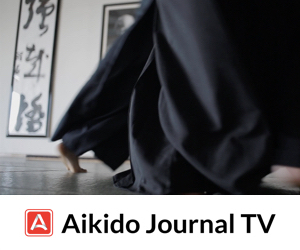 Aikido practitioners typically embrace the grab of an attacker and use it to their advantage. However, there are times when escape is the best course of action. This is when grab releases become valuable. In this full speed randori exercise, Nastia’s already caught by one attacker and has two others closing in quickly. If she attempts a throw or control, she’ll be an easy target for the other two attackers. They’ll reach her mid-throw when she’s still engaged with the first attacker. At Ikazuchi Dojo, we use grab releases in a variety of scenarios. Being able to quickly release a hold and disengage from an attacker is critical for success in the type of randori we practice at the dojo. We believe grab releases are a practical and valuable self-defense tool, as well. Fast Disengagement: Quick extraction from an unfavorable situation. Ideally, an opponent’s grab provides a point of contact that can be used to break balance (kuzushi) and control or throw. However, there are many scenarios in which that outcome is simply not possible, especially when facing multiple attackers. Resets the scenario: Disengagement and repositioning, “resetting the game”. This is a clear advantage in a situation when one or more attackers have gained positional dominance. Easy to Learn: Elementary and relatively easy to execute. With an understanding of the underlying mechanics, one can build an effective grab release much faster than developing an effective throw. 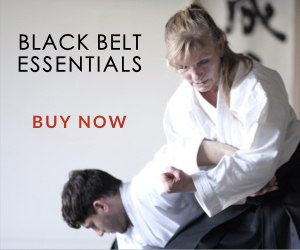 Because of this, we believe grab releases are an excellent, high-yield skill to develop for any martial artist or individual seeking basic self-defense skills. Doesn’t break the attacker’s balance (kuzushi): The initial moment of contact with an attacker provides an opportunity to break their balance and control or throw them. Releasing from a grab removes that initial point of contact and takes away your ability to direct power into their body structure. Another point of contact can be proactively established quickly after a release, but the initial control opportunity is lost. Diminished effectiveness against attackers with huge hands: Wrist grab releases benefit significantly from exiting through the weak point between an attacker’s thumb and fingers. When dealing with a grab in which the attacker’s hand wraps completely around the wrist, you’ll need increased technical skill and proper body structure to make the release work. An atemi (vital point strike) is an excellent tool to employ in a scenario like this. Note that this weakness only occurs with wrist grabs. Grabs on the upper arm or torso don’t suffer this disadvantage. Resets The Scenario: Listed above as an advantage, a reset can also be a disadvantage if used improperly. If an opportunity to control or throw an attacker is relinquished, you’ll need to start over and risk another potentially dangerous face to face encounter with an attacker. Using a grab release to get out of a terrible situation is good. Releasing a grab when an opportunity exists to turn it into a control point can become a potentially dangerous setback. Randori: In our style of randori practice, three attackers will launch a continuous stream of attacks without hesitation or pause. If one attacker gets their hands on the nage, the other two will quickly close range, grapple, and initiate a takedown or choke. Being able to clear a grab from a single attacker allows nage to reposition freely without being anchored down as a static target for the other attackers. Rose Jones using a grab release to disengage from Thilo. She’s not in a position to throw, so her only option is to escape and reposition before Nastia can reach her. Self-defense: Many abductions and assaults on a physically smaller or weaker target begin with a simple grab. Being able to quickly disengage from a grab and run is one of the safer and more accessible self-defense tactics. Point of Contact Control Transfer: When executing certain techniques, we combine a grab release with a simultaneous counter grab. 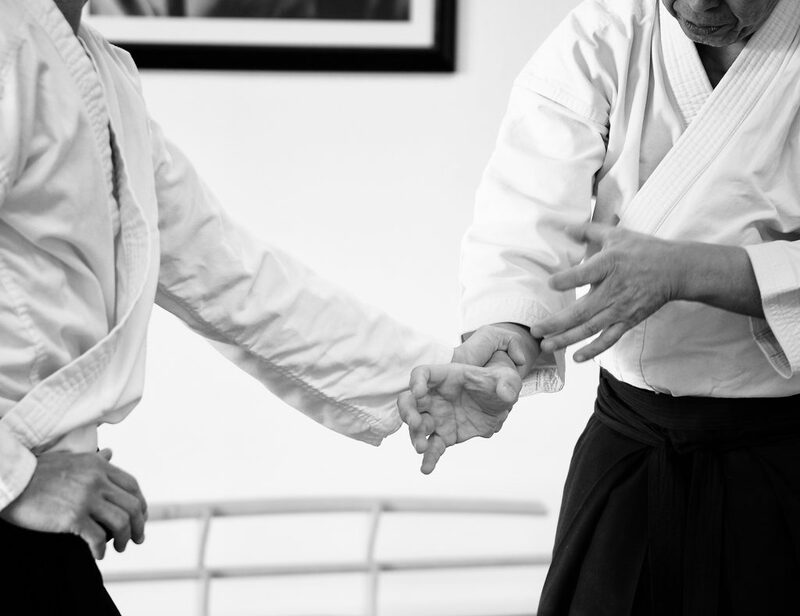 This allows us to transfer the control of the point of contact from the uke to the nage. When an attacker grabs, you have a point of contact to work with, but they can let go at any time. An attacker with a high degree of body sensitivity will often disengage from a contact point if they realize it’s being used against them. 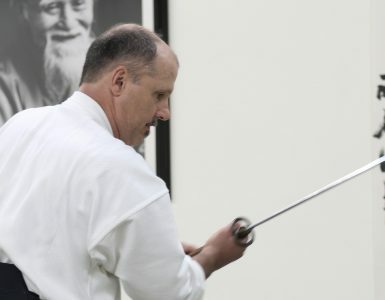 For someone of Matsuoka Sensei’s level, this would rarely occur, but for less skilled practitioners (like the rest of us at the dojo), leaving the point of contact under the attacker’s control is a greater risk. However, if the point of contact is controlled by the nage, the uke does not have the option to easily disengage. This tactic is not necessary, or even advisable for many techniques. 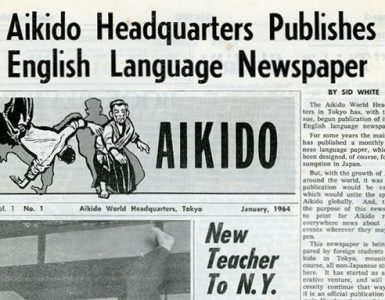 However, we believe it’s worthwhile for any aikidoka to think about this concept and use their own judgement with its application. Using a grab release to transfer control of the point of contact from the uke to the nage. Single Grab Releases: Practice single releases from a variety of grabs to ensure basic fluency with the movements. 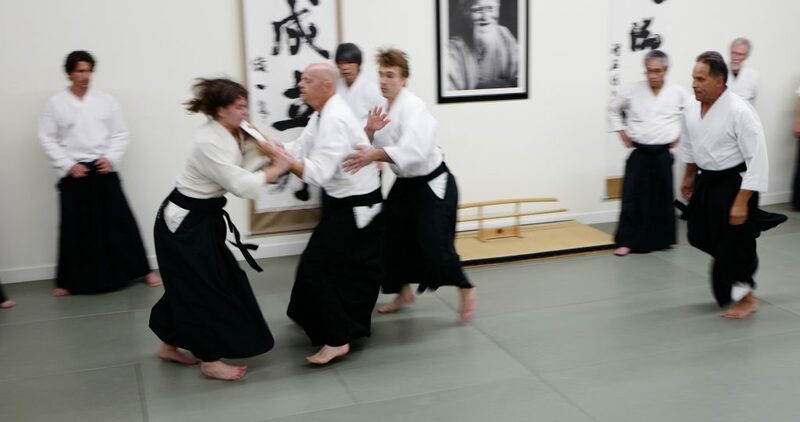 Key grabs to practice include same side and cross hand wrist grabs (katatedori and kosadori), two handed wrist grabs (morotedori and ryotedori), upper arm grabs, lapel grabs, and shoulder grabs. We also practice releases from grapple attempts and holds on the lower body, but that’s outside the scope of this article. The key here is to learn to apply the basic release principles to any grab variation. We want this ability embedded into muscle memory. Reflex and Adaptation Drills: Once the basic forms are learned, we practice attacking with a series of free-form, unscripted grabs. As soon as the nage releases, the uke will grab again. If the uke gets a firm hold with one hand, they’ll grab with the other hand and move to immobilize the nage. This exercise can be practiced with one or two attackers. Forcing the nage to isolate their response to a grab release (no atemi, throws or controls) quickly develops effective and flexible grab release responses. Technique Application: As outlined above, some of our techniques use grab releases as a way to transfer control of a point of contact from the uke to the nage. This is practiced as a component of our regular technique training. Body Structure Refinement: The effectiveness of grab releases increases dramatically when one is able to unify their body movement. We practice a range of exercises to cultivate proper body structure. We want to ensure that the shoulders stay in alignment with the hips (no upper body twisting) and that the movement of the arms is linked to movement of the core without creating movement gaps or slack. Safety Note: Ukes need to use caution with their grabs to prevent injury. When grabbing a gi instead of bare skin, ensure the tips of the fingers and thumb don’t get too deeply entangled in the gi. A grab release can easily dislocate or break fingers if they catch inside fast moving fabric. We’d love to hear from you if you have any insights or experiences you’d like to share related to grab release techniques and tactics. Excellent. That’s half of a class, the first half being “effective grabs”. I define an effective grab as one which exerts a degree of control over the grabbed without just making yourself an easy target. The basic plan is to lock the arm up at the wrist and elbow to control the shoulder. Once you have control of the shoulder you can do all sorts of things. Aikido techniques work very well from effective grabs. 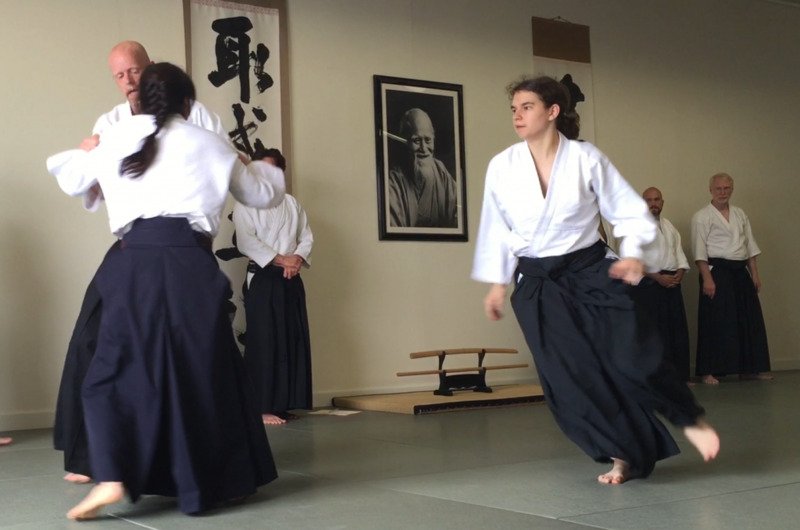 Other grabs may thwart aikido techniques, but allow simple stuff like punches and kicks. In our community and youth self defense classes ‘wrist escapes’ are one of the first things we teach. In a real self defense situation the first goal is escape. We too emphasize that the space between the thumb and first finger is a vulnerable opening. We teach two simple methods; prying away and going around the grab. For same side grab (Katatedori/gyaku te) we have nage present the hand in a ‘hand shake’ position and is grabbed at the wrist by uke. Nage is taught to rotate the hand ‘palm down’ without tugging or struggling. This takes advantage of the shape of the bones of the lower arm and acts as a ‘cam’ to pry open the grab. This is practiced very slowly at first with very strong grabs then stepped up so that it looks like a ‘snatching away. The kosa dori variation is best described as being like the ‘thumb a ride’ kotegaeshi ura. For the circumstance of a very large hand getting a ‘full wrap’ grip on the wrist we teach atemi with the knuckles of the other hand against the tender bones on the back of the grasping hand and/or atemi to the elbow to illicit a momentary loosening up reflex. 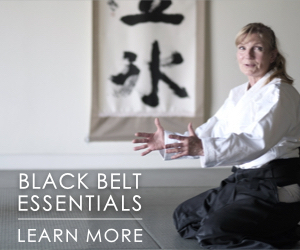 We have not used the ‘anchoring’ principle Josh Sensei shows; another tool to ad to the kit! 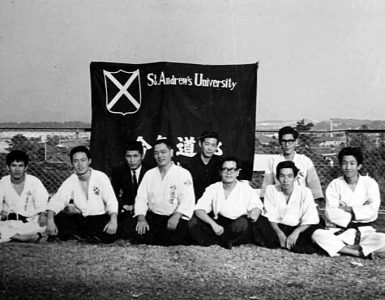 Here is a You Tube excerpt from the 2nd Aikido Friendship Demonstration Part Two, organized by Stanley Pranin Sensei October 25, 1986 in Tokyo. Mochizuki Sensei explains the theory of Tehodoki with Junkatatedori, first basic Tehodoki of the sixteen basic Tehodoki taught at the Yoseikan. It is in Japanese and the quality of the video is mediocre, but Mochizuki Sensei was an excellent teacher and his demonstrations spoke for themselves. 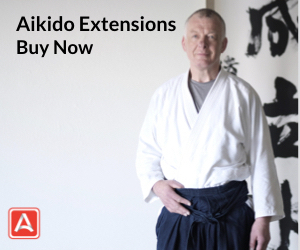 A DVD is also available at Aikido Journal which also features Shioda Sensei. The quality of the video as well as the English translation provided by Pranin Sensei are excellent. I highly recommend it! To my present knowledge only Tomiki Sensei’s Shodokan and Mochizuki Sensei’s Yoseikan, both early students of Ueshiba Sensei’s have been teaching Tehodoki as part of their curriculum. Does any one know of other schools still teaching it? Thank you for reopening this topic.